A TV studio. On your iPad. Producing broadcast-quality interactive videos used to require expensive equipment and a team of professionals. And then came Studio. 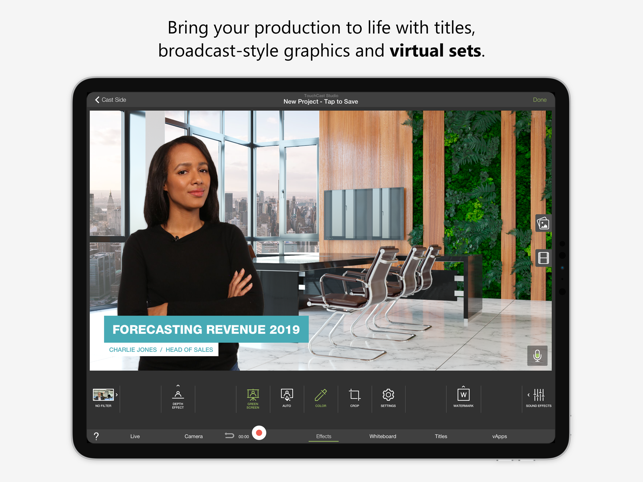 With TouchCast Studio, you have the power of a high-end TV studio at your fingertips. 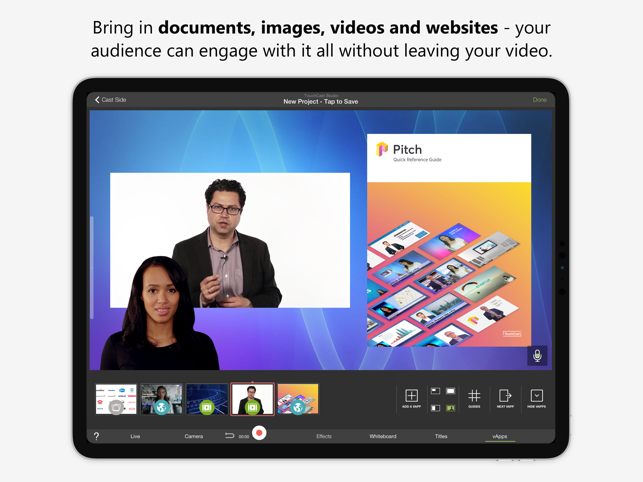 Record a video, edit clips, and add dynamic, interactive features like soundtracks, graphics, and web pages directly from your iPad. 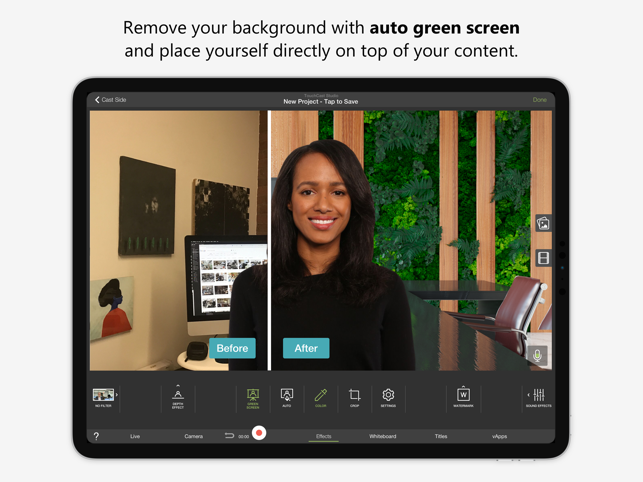 All the great features of TouchCast Studio are available for live video. 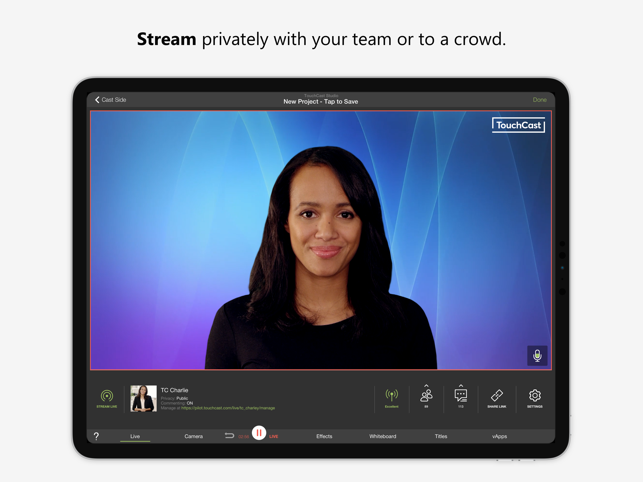 Stream privately with your team or to a crowd, measure audience interactions with advanced video analytics, moderate comments, and watch as your engagement rates rocket. Small update with improvements and bug fixes. I’m trying to sign up with this for a school project and I’ve spent 10 minutes trying to get the questions right, but keep getting them wrong. For example, it asked me to choose photos with a bus. I clicked every photo with one and waited for the next picture to replace the last one. I kept doing this until in every photo, THERE WAS NO BUS. There was literally no bus but it kept saying to try again when I verified that they were all gone. I even took a screenshot of my screen right before I verified to show the people around me that something is wrong with the verification. Multiple people have agreed with me, there is no photo with a bus left. 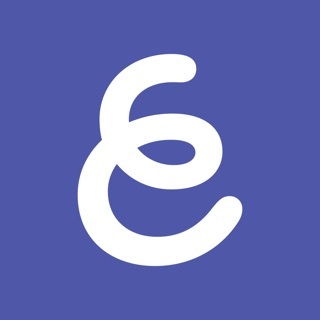 It shouldn’t be this hard to create an account with a video making/editing app. It’s not like this is a banking app where there should be many verification steps. Please fix this so I can use this app on future projects, because I can’t currently use it. Tbh I don’t even want to review the rest of this app. 1. Something was wrong with the human verification, it kept showing me fire hydrant pics, roughly around 10 different ones. Not sure why. 2. There was a bug right after the signup, saying its signing me in, but it just got stuck there. 4. It took me a total of 20 minutes just to start using this app. This was a bug that was fixed in v1.19.6 where iOS11 screen capture video would get turned sideways. 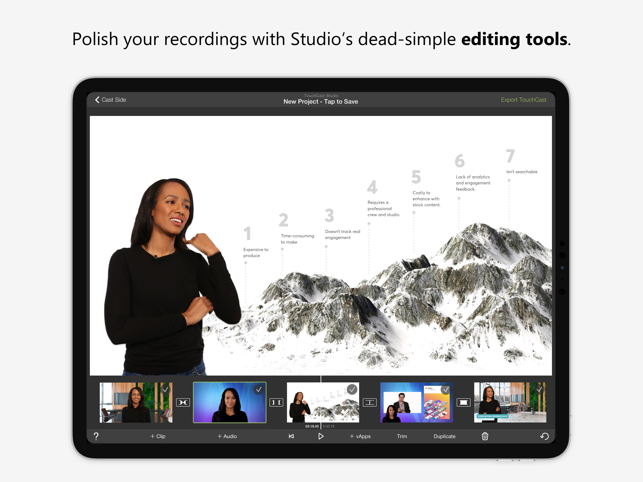 Please make sure you update TouchCast Studio to the latest and greatest!